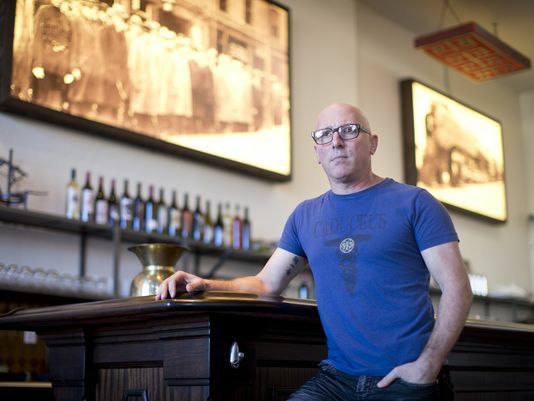 Maynard James Keenan, the lead singer of Tool, has ended his association with Arizona Stronghold, leaving the state’s best-selling and highest-volume winery without an asset that led to its initial popularity. Under the deal, Keenan will take possession of Arizona Stronghold’s southern Arizona vineyard, which he will rename. Eric Glomski, the other co-founder, will keep the winery in Camp Verde and rights to the Arizona Stronghold brand. More details can be found on the full article on Arizona Central. Maynard’s work with Eric was outlined in the documentary Blood Into Wine. Congratulations to Maynard, Eric and the whole Caduceus/Merkin team on their effort. Now how about getting some of that wine Down Under? Interested in buying some wine? Then you can order it directly from Caduceus at http://vino.caduceus.org/. Also, don’t forget the upcoming Wine Signing sessions. I arrived 4:25pm, with at least what looked like a hundred people online outside the building. No parking in sight, I parked way down the road and had a nice walk to The Wine Library. I got lucky and found a spot with a meter. Other people were parking any where, and it was later announce that cars were being towed ! The Wine Library is two floor building with an elevator. Some people were filling up shopping carts so the elevetor made sense later. I called ahead and was told I had to go in first and purchase the wine before the signing. Great at least for the moment I didn’t have to stand out in the rain. The middle of June and I was in a leather jacket ! The temperature had dropped recently due to all the heavy rain. Once inside an older gentleman, he asked if I was here for the signing. After giving him my yeah, he tells me people had been buying since 6 a.m ! I was told there were only two types left. The Caduceus and The Anubis, what I had to do was goto the cashier pay and I would receive a ticket to redeem the wine later. He handed me the menu, I’ve included the picture of the menu front and back. OK wait a few minutes for the line to move, the cashier says all they have left was Chupacabra and The Anubis. The old man was wrong ! OK whatever, I decided to get two Chupacabras, one for me and one for my cousin who was getting married. After paying she aske me how many people will be going back with me for the signing ? I said one, she quickly yells out I need one yellow, referring to the ticket (which was green WTF ?). She hands me a Vayner Nation wrist band, my receipt and the ticket. Cashier say don’t lose the ticket or receipt, that’s proof you get two bottles. I wouldn’t get any wine if I was missing either. The cashier then tells me I can look around and taste cheese upstair. Hey at least I didn’t have to go outside to the rain and wind. And I said no to the cheese, hey I was driving ! OK so it’s now 5:15pm, I was told Maynard was already there and signing bottles. I had to wait now for my number to be called. There was a line already from number that were called before I arrived. Maynard and Eric were in the back room. An employee told me they expected at least one thousand people. They looped the videos, but only played the introduction and episode one, with episode two for the following day. Realistically none of the Maynard fans would see the video the following day but oh well what do I know ? Now some guy comes walking around asking people if they know the guy in the middle of the video (Gary Vaynerchuk), people said no. Then he said he’s my son ! Now people trying to get everyone to try the Verve energy drink. I heard people say it was gross and luckily I wasn’t asked to try a sample can. People move around and I go to one of the computers. OK I was gonna twitter you what was going on, no such luck. No access to the ‘Net. I’m closer to the tv but still can’t hear anything. They start calling numbers. Great things are happening and moving. People go downstairs and I grab a seat, and stare at a video I can’t hear. Some time passes and they call another group ending in the last four numbers on the ticket. I was one over the number. OK they call my group next, great I run down stairs and prove I’ve paid etc. OK I officially waited an hour just to get in the line. The line moves a little an then stops. Maynard decides to take a fifthteen minute break. While in line there’s signs posted down each aisle that read only wine purchased today would be signed. No memorabilia. And absolutely no hand shaking ! Since Maynard, and I guess consequently Eric are on break employees try to get everyone on the mailing list. I don’t get asked and wouldn’t have given my e-mail anyway. Still on break and now more employees ask people if they want any other bottle they would hold our place in line while we purchase more bottles. They were running out of bottles and wanted to get rid of whatever they had left over. The line starts moving again. No chairs and I pray I don’t break any bottles while waiting. Now getting closer to the back room, we were told no hand shaking, only bottles purchased today would be signed. No photographs (this one is always understood =P). We get handed a coupon on free shipping if we decide to purchase wine online. In addition we are given two post cards, pictures included. Sadly the post cards didn’t scan well. Now I get to enter the back room. Slighty chaotic. They take my jacket and put it in a box and was told I get it back at the end. They ask for the receipt, give it an “X” then hand me a Wine Library bag with both my bottles. The room is a maze of white styrafoam coolers nearly stacked to the ceiling. A little more waiting but lines is moving quickly. There was a box with a sign that said, Gifts for Maynard. Sadly there was a pack a cigarettes, a few buisness cards, cd, and some scraps people threw in the box. The box was virtually empty. Two employees keep people from going an head and a police woman eye balling everyone. I stuck my head around and I see Eric and Maynard. Eric was on the right half of the table. I was told to enter and they grab my wine, Eric never looks up and is talking to an employee as he signs my bottles. He slides my bottles to Maynard. I said hey how’s it going ? Maynard replies good how are you ? I say fine, thank you. I asked Maynard how long before I could enjoy the wine. Maynard says you should let it breathe for five to six hours. I then said I read that I should wait a year. Maynard’s response was it should “lay” a year, but I could enjoy it now. Maynard was happy someone was talking to him. No rules against talking to Maynard ! Now people are waiting, I walk behind the other police officer so Maynard and hand me mine wine. I had one more question, and it was for you Matthew. I quickly ask Maynard if he’s gonna do signings in Australia. He didn’t hear me, he said I’m sorry what ? I ask again. He quickly said No =(. I start to walk away, all this is happening quickly but I am slowing the line a little. I quickly said thanks for all the great music, he nodded his head. I walked around and got my jacket and was lead out the back door back outside. The entire wait may have been and hour and half. Everything went by quickly. I didn’t get excited until I was face to face with Maynard. a documentary about the efforts of TOOL frontman Maynard James Keenan and his partner Eric Glomski to establish a wine-making industry in Arizona’s Verde Valley is about to go into production. According to Keenan‘s publicist, the film will be co-directed by Christopher Pomerenke and Ryan Page, the same team that made the acclaimed music documentaries “Moog” and “The Heart Is A Drum Machine”. The movie will showcase the “unusual and often metaphysical ” location of the business, described by Keenan as “thick, dense, rich, complex, engaging and spiritual,” while also profiling the mysterious singer and his wine-making partner. Sounds like a something worth seeing when released.